Washable paint / decorative / for walls / for interior - TOPGREEN 5 - COLORIFICIO ATRIA S.r.l. Flooring & Wallcovering > Paint, Decorative plaster > Decorative paint > COLORIFICIO ATRIA S.r.l. 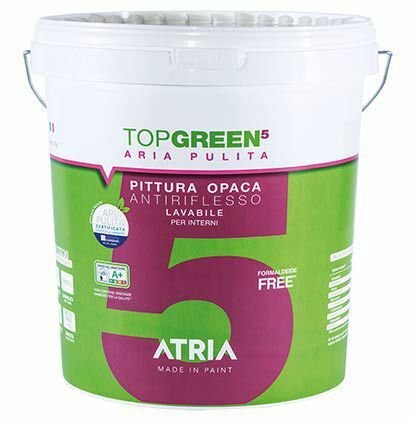 TOPGREEN 5 COLORIFICIO ATRIA S.r.l. WASHABLE PAINTING CLASS A + MATT ANTI-GLARE INSIDE HIGH COVERAGE, EXCELLENT EXPANSION AND EASY APPLICATION. CLASS A + CERTIFIED - FORMALDEHYDE FREE. CLEAN AIR ACTION CERTIFICATION: PURIFIES AIR ENVIRONMENTS PROCESSED. FOR INTERIOR.